Outdoor Activities Made Easy: If you love engaging in outdoor activities and biking but live in a small space and don't have enough storage, this rack is for you. Amazing for hanging your bike on the wall and storing your helmet on the shelf while creating floor space with ease. this could be your solution for displaying how athletic you are to your co-workers and keeping your bike neatly stored where you can see. while decorating the room with their favorite items beautifully displayed on the wall. Create a horizontal storage solution for your outdoor bicycle with ease. Utilize your empty walls functionally and create more floor space. 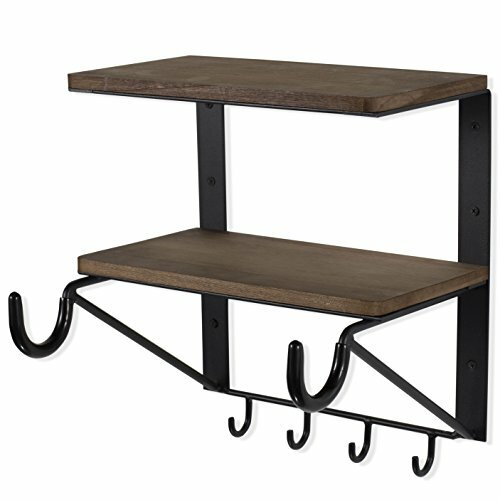 Hang your bike and store your other outdoor activity essentials on the tiered shelves while decorating and organizing your space easily. Please see pictures for additional dimensions information. Installs Easily and Saves Space: This wall mountable bike rack comes with all the mounting hardware to make installation a breeze. You will no longer need professional help to create an organized space no hassle. Please hang a wall stud to hold this heavy-duty rack on all types of wall materials using the zinc anchors and screws provided. Compact, Spacious and Well-Made: With high-quality wood and metal materials this tiered wall unit is 12.40 inches tall, 11.75 inches long and approximately 11 inches wide. Add flair and style to your small studio apartment and keep it organized or tidy up your garage with ease. Great for All Your Outside Gear: Hang your bike on the wall to free-up sufficient floor space in your jam-packed garage, but you can also store your dog leash, cat collar, exercise gear or sports equipment, all on the same wall. Horizontal Bike Storage Solution: Whether you have an electric bike, or a mountain bike does not matter, you can hang it all on this simplistic yet chic wall storage unit. Create a neat and tidy space to keep all your outdoor activity equipment in one compact space. Entryway Organization Done Right: Create a functional welcoming space with this shelving unit hung right across or next to your entryway door. Foyer organization is an essential and this storage solution has it all, you can display, decorate and keep your essential needs close at hand.